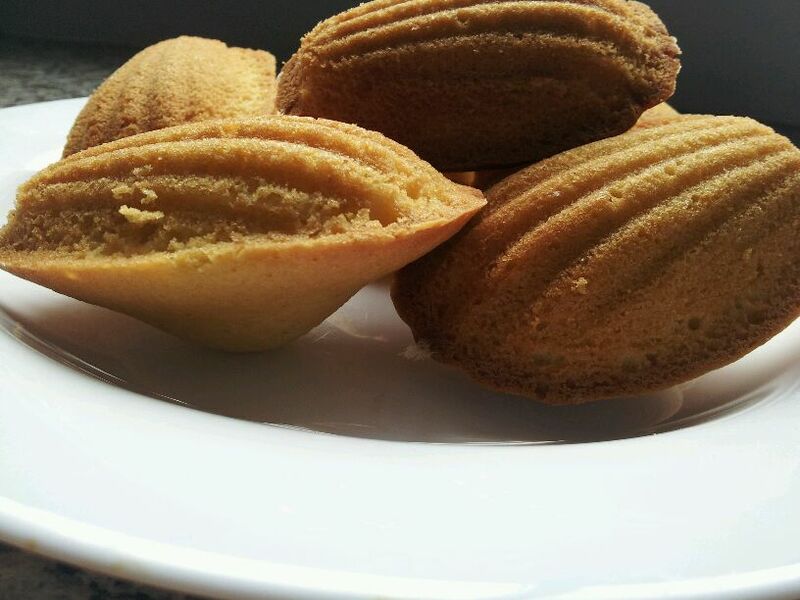 At Cordon Bleu I learned how to make these lemon cookie-cake things in the shape of a shell, also known as Madeleines. They were originally made in Commercy, France, and were inspired by sponge cake (aka Genoise). For Christmas this past year, I asked for a Madeleine pan, and at long last I found a chance to use it! At LCBO (Le Cordon Bleu Ottawa), the French chefs insist that Madeleines are presented with the shell side facing down. This just doesn’t make sense to me, as the nice pattern just goes to waste. 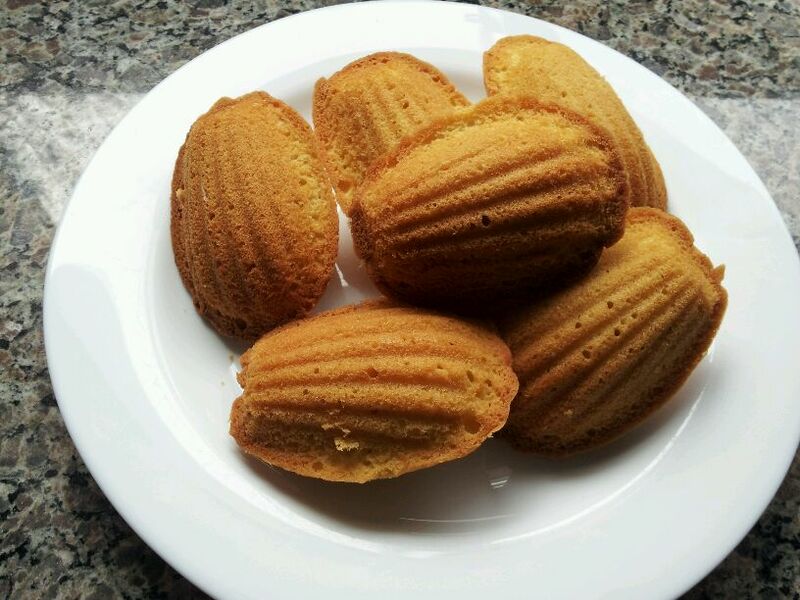 As such, any French pastry chef out there might think the Madeleines below are upside down. I sifted together the flour and baking powder, then in a separate bowl whisked the sugar, lemon zest, and eggs together vigorously until they turned a light colour. Meanwhile, in a small pot, I made beurre au noisette. This involves boiling the butter until brown specks appear in it. I removed the pot from the heat as soon as I saw this happen. 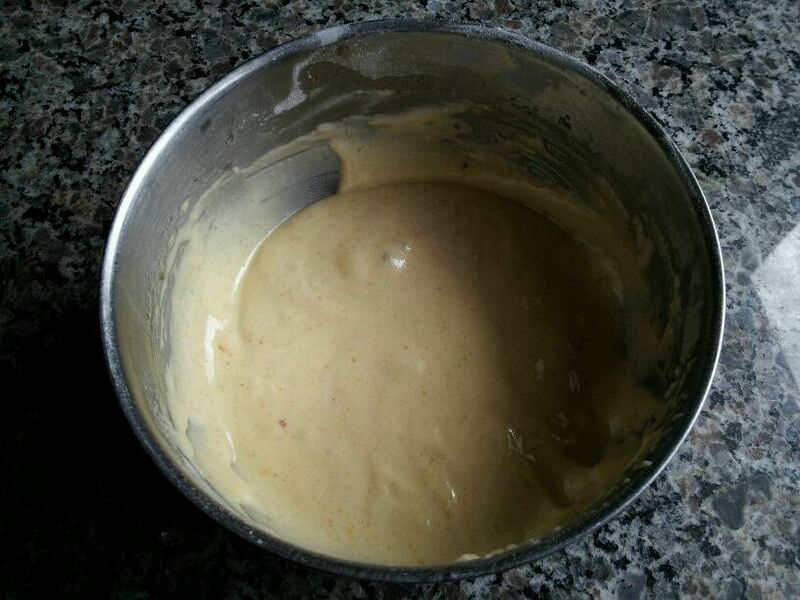 With a whisk, I mixed the flour mixture with the egg mixture, then added the milk, then the butter. I covered the bowl in plastic wrap, and refrigerated the batter for an hour. This allows the flour time to absorb the liquid. I buttered the Madeleine pan well, and spooned the batter into each shell, about half-full (I think I over-filled mine just a tad). They baked at 370 degrees Fahrenheit until golden brown (about 15 minutes, turning the tray half-way through). This is a very simple recipe to make, and there is a lot of potential for experimenting with the ingredients. You can dip them in chocolate, use any kind of zest you want, add cinnamon, or replace 10% of the flour with cocoa powder, for example. Now I want to make more and try this! Too bad I’m out of eggs. Oh, and happy pi day! I would have made pie today if I hadn’t spent 8 hours yesterday making pie at work, in preparation for today. For those of you who don’t know, today is March 14th, or 3/14, which is sort of like 3.14, which is pi (the amount of times the diametre of a circle fits around its circumference). For math geeks and pie lovers, this is a special day. I am more of the latter, but I did like math in school, so maybe I’m a bit of both! Your posting arrived in my mail box at exactly 3:14!!!! Can you believe that? Of course that was Arizona time. No way! That’s just perfect!